The constant mischief of the progressive left is hurting the nation’s morale. There are few areas of national life left in which they are not busy, and few in which they’re not making it worse. There are always more regulations, fees and fiats, always more cultural pressure and insistence. The president brags he has a pen and a phone. He uses the former to sign executive orders. It is not clear why he mentioned the latter since he rarely attempts to bring legislators over to his side. Who exactly is he calling? The most hopeful thing he’s done is signal this week what he’ll be up to after he leaves. He will work with young minority men. Good. He is a figure of inspiration to them, and they need and deserve encouragement. This also leaves us understanding for the first time the true purpose of his so far unsuccessful presidency: to launch a meaningful postpresidency. I’m glad that’s clear. But to American morale. Here one refers to recent polling data. Gallup in December had 72% of those polled saying big government is a bigger threat to the future than big business and big labor—a record high. This may be connected to ObamaCare, an analyst ventured. Rasmussen this week had only 32% of those polled saying the country is headed in the right direction, with 61% saying we’re on the wrong track. Both numbers fluctuate, but the right track is down two points since this time last year and the wrong track up three. Gallup also had only 39% of respondents saying they saw America in a positive position, with less than half thinking it will be better in five years. None of these numbers are new, exactly, as they reflect long-term trends. But they never lose their power to startle. The persistent blues, the lack of faith, the bet that things won’t get better—it just doesn’t sound like America. We are suffering in great part from the politicization of everything and the spread of government not in a useful way but a destructive one. Everyone wants to help the poor, the old and the sick; the safety net exists because we want it. But voters and taxpayers feel bullied, burdened and jerked around, which again is not new but feels more intense every day. Common sense and native wit tell them America is losing the most vital part of itself in the continuing shift of power from private to public. Rules, regulations, many of them stupid, from all the agencies—local, state, federal—on the building of a house, or the starting of a business. You can only employ so many before the new insurance rules kick in so don’t employ too many, don’t take a chance! Which means: Don’t grow. It takes the utmost commitment to start a school or improve an existing one because you’ll come up against the unions, which own the politicians.It’s all part of the malaise, the sclerosis. So is the eroding end of the idea that religious scruples and beliefs have a high place that must culturally and politically be respected. The political-media complex is bravely coming down on florists with unfashionable views. On Twitter Thursday the freedom-fighter who tweets as @FriedrichHayek asked: “Can the government compel a Jewish baker to deliver a wedding cake on a Saturday? If not why not.” Why not indeed. Because the truly tolerant give each other a little space? On an optimistic note, the Little Sisters of the Poor haven’t been put out of business and patiently await their day in court. 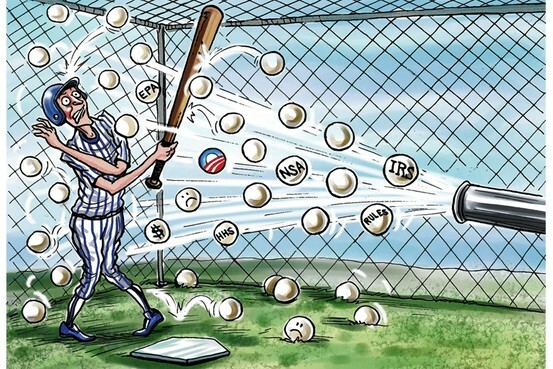 I think a lot of people right now, certainly Republicans and conservatives, feel like a guy in a batting cage taking ball after ball from an automatic pitching machine. He’s hitting the ball and keeping up and suddenly the machine starts going berserk. It’s firing five balls a second, then 10. At first he tries to hit a few. Then he’s just trying to duck, trying not to get hurt. That’s how people feel about the demands and dictates. The balls keep coming at them politically, locally, culturally. Republicans and conservatives comprise at least half the country. That’s a lot of people. In the dark screwball comedy that is ObamaCare, the Congressional Budget Office revealed last month the law will provide disincentives to work. Don’t worry, said Nancy Pelosi, people can take that time and go become poets and painters. At first you think: Huh, I can do that, I’ve got a beret. Then you think: No, I have to earn a living. Then you think, poor hardworking rube that you are: Wait a second, I’m subsidizing all this. I’ve been cast in the role of Catherine de Medici, patroness of the arts. She at least had a castle, I just get a bill! Imagine that—you have real problems caused by a bad law, and Mr. Reid tells you that what you are experiencing in your own life is a lie made up by propagandists. He sounded like Lenin. There is no cholera in the new Russia. The NSA is a real and present threat to your privacy, HHS actually never has to come up with a true number on ObamaCare enrollments or costs, and at the EPA no one talks anymore about why Al Armendariz, a top regional administrator, felt free to brag in a 2010 speech that his “philosophy of enforcement” could be compared with the practice by ancient Roman soldiers of crucifying random victims. When it surfaced, he left the agency. Did his mind-set? People feel beset because they are. All these things are pieces of a larger, bullying ineptitude. And people know, they are aware. But the left too is damaged. They look hollowed out and incoherent. Their victories, removed of meaning, are only the triumphs of small aggressions. They win the day but not the era. The result is not progress but more national division, more of a grinding sense of dislike. At first it will be aimed at the progressive left, but in time it will likely be aimed at America itself, or rather America as It Is Now. When the progressive left wins, they will win, year by year, less of a country.